Last night I finished my Part 2 and Part 3 for the Easy Street mystery. I used my “Alternate Method” for making the units in Step 3 and I had them finished in a flash. I’m very excited to be keeping up with this mystery. I’ve still got Orca Bay, Roll Roll Cotton Boll, and Carolina Christmas in my UFO pile. And, Double Delight is waiting to be quilted. I’m not letting this happen with this quilt. Yesterday, I finally got busy on making some Christmas gifts. I made this really cute little baby doll sleeping bag for my grand-niece for Christmas. I used Connie Reskin’s pattern and it was so easy to put together. I got the 8” baby doll at Target. In addition, I made three Lavender Eye Pillows for my nieces. I think I’ll write up a tutorial about how easy it is to make those. Linking up to Bonnie’s Part 3 Linky Party and Connie’s Tuesday Linky Party. I’m glad you are doing the Easy Street mystery quilt, this is so much fun! I love the colors you used in the sleeping bag……funny I was just thinking the other day that I should make a couple more. Glad you liked the pattern! Thanks for sharing. Your patches look fantastic. Clue 4 is nearly here – woo hoo! Wow, you are moving along well on the mystery! I am planning to do mine with your alternate method – I have cut my blues, but am not much farther than that! Love the doll sleeping bag too! I’m keeping up too! 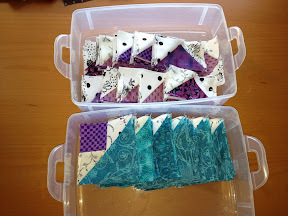 I love looking at all the different versions of the same quilt blocks. I am new to quilting and this is my very first mystery. In fact, I had never heard of a mystery quilt before! I think I’m really glad that Easy Street is my first one. 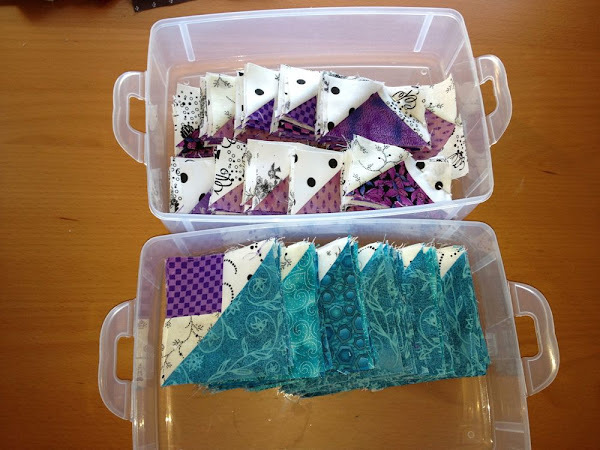 So many people have mentioned that they haven’t finished their other mystery quilts. This will be a great way for me to get started! Your little baby doll sleeping bag is so cute! I’m sure your grand-niece will just love it. Next you’ll have to make one for her to sleep in! 🙂 Happy sewing!